Two-photon imaging of CF3 in cultured dissociated hippocampal neurons shows how the addition of the BCS chelator shrinks the presence of labile copper pools. In recent years it has been established that copper plays an essential role in the health of the human brain. Improper copper oxidation has been linked to several neurological disorders including Alzheimer’s, Parkinson’s, Menkes’ and Wilson’s. Copper has also been identified as a critical ingredient in the enzymes that activate the brain’s neurotransmitters in response to stimuli. Now a new study by researchers with the U.S. Department of Energy (DOE)’s Lawrence Berkeley National Laboratory (Berkeley Lab) has shown that proper copper levels are also essential to the health of the brain at rest. Chang , who also holds appointments with the University of California (UC) Berkeley’s Chemistry Department and the Howard Hughes Medical Institute (HHMI), is the corresponding author of a paper that describes this study in the Proceedings of the National Academy of Sciences (PNAS). The paper is titled “Copper is an endogenous modulator of neural circuit spontaneous activity.” Co-authors are Sheel Dodani, Alana Firl, Jefferson Chan, Christine Nam, Allegra Aron, Carl Onak, Karla Ramos-Torres, Jaeho Paek, Corey Webster and Marla Feller. Although the human brain accounts for only two-percent of total body mass, it consumes 20-percent of the oxygen taken in through respiration. This high demand for oxygen and oxidative metabolism has resulted in the brain harboring the body’s highest levels of copper, as well as iron and zinc. Over the past few years, Chang and his research group at UC Berkeley have developed a series of fluorescent probes for molecular imaging of copper in the brain. Two-photon imaging of CF3 shows that the addition of acute BCS dosages also reduces labile copper pools in retinal neurons. For this latest study, Chang and his group developed a fluorescent probe called Copper Fluor-3 (CF3) that can be used for one- and two-photon imaging of copper ions. This new probe allowed them to explore the potential contributions to cell signaling of loosely bound forms of copper in hippocampal neurons and retinal tissue. With the combination of CF3 and Ctrl-CF3, Chang and his group showed that neurons and neural tissue maintain stores of loosely bound copper that can be attenuated by chelation to create what is called a “labile copper pool.” Targeted disruption of these labile copper pools by acute chelation or genetic knockdown of the copper ion channel known as CTR1 (for copper transporter 1) alters spontaneous neural activity in developing hippocampal and retinal circuits. The results of this study suggest that the mismanagement of copper in the brain that has been linked to Wilson’s, Alzheimer’s and other neurological disorders can also contribute to misregulation of signaling in cell−to-cell communications. This research was supported by the National Institutes of Health and the Howard Hughes Medical Institute. 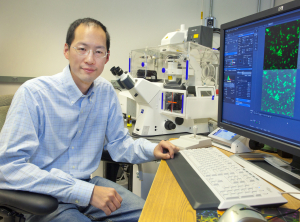 For more information about the research of Chris Chang’s lab, visit his Website here.